The New York Times called Chetan Bhagat as the biggest-selling English-language novelist in India’s history. With his first three books already being widely read in India, he released his fourth book recently which generated a lot of anticipation before the release on Twitter and other online spaces. 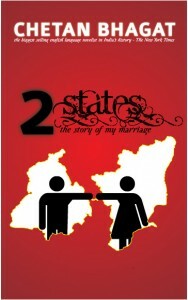 Chetan Bhagat released the new book on Oct 8th, titled, 2 States: the story of my marriage. It’s a story of inter-state marriage in India. Love story of a Punjabi guy Krish, and a Tamil Brahmin girl Ananya. Marriage of paranthas and idlis, paneer and coconut. Chetan, in his own style, dedicates this book to his in-laws. In the disclaimer, he says, though the book is inspired by his own family and experiences, he requests the book must be seen as a work of fiction. The initial pages of the book are set up in IIM-Ahmedabad. Krish and Ananya meet in the canteen for the first time and eventually over a few days of combined study, fall in love. Life is great for them until their families meet each other. It takes sometime before they realize that they may not be able to convince their families to support their marriage. The twist in the tale is, they want to marry with their parents’ consent rather than choosing the easy way of eloping. Inter-caste marriages are still a taboo in India and let alone an inter-state marriage of a Punjabi and a Tam Brahmin. The meeting of two families on the convocation day at the college, sets the drama into motion. Rest of the story is about how youngistan fights oldistan to get the approval for marriage. The boy tries to get acceptance from the girl’s family and the girl tires to get acceptance from the boy’s family while both of them are trying to get acceptance from their respective families. I am not going to reveal everything here as I don’t want to be a suspense spoiler.To ease the nerves of those who involve too much into stories, let me say that it has a happy ending. In fact, how can it be made into a bollywood movie if it has a sad ending. The cultural differences of north-indian families and south-indian families are portrayed very well in a funny way. Humor is one of the best things in this book. Loaded with some really good similes and metaphors. If you are a Chetan Bhagat’s fan, you will enjoy this book more than his previous book, Three mistakes of my life. For those who are not fans of Chetan’s books, or haven’t read his books yet, I would say, you pickup this book if you want to kill a boring afternoon with ‘a quick read’. If you are a fan of literary fiction and classics, if you read more of Tharoors, Seths, Roys, and Ghoshs, I would say it is better you stay away from this book. Coming to me, I am not a great fan of Chetan’s books. I enjoy reading his books as they are very easy to read. Yes, I do admire what he has achieved: success, fame, and of course money, with his books. I like his diction and his subtle observations and the way he weaves them in to the stories. I think, the best from him is yet to come. For me, the best till now is no doubt his first book, Five point someone. To end, I am sure this book is going to be made into a movie. Unlike his previous books being made into bollywood films, this story best suits for south-indian movies. Chetan, any of the Telugu movie producers already approached you? By the way, do you want to write like Chetan Bhagat? This entry was posted in: BooksBookmark the permalink. Post a comment or leave a trackback: Trackback URL. I don’t know how a non-Tamilian would react to this book, but as a Tamilian, I just loved this one. There are so many subtle points which only a Tamilian would understand. For example, some of the things mentioned about a Tam Bramh family is something that only a person from Tamil Nadu/Kerala would understand. I am pretty sure this book would be made as a Tamil movie. Not sure if it would work in Bollywood though! Welcome to my blog. Good to see your thoughts. Definitely there are subtle points that are really intriguing and funny. As a south-indian I can relate to few of them. The book starts on a very humourous note, which reminds you of all the engineering colleges in India, be it NITs or IITs, where females are considered 2 b an endangered specie. The story becomes quite boring after the first few chapters, but it catches up eventually..till it has u reading fanatically to know what comes next. The humour is superb, had me roaring with laughter a few times. The emotional part is good, not overdone.It is not exactly the un-put-down-able types, but quite a good read. Worth the money. Thank you for sharing your thoughts. Yeah nissa u are very correct in what u said..the book is really very humorous which is the best part i felt about the book..and it becomes a little boring about some of the first chapters (as u have already mentioned) but ya after it catches up no one can wait till the story gets over..liked this 1 a lot..
Fun reading indeed…..a chick-let at core…..may be catered to reality-shows-V-M-tvs-addicted generation ……. It may open the flood hates to few more IIM/IIT writers into d market……. may be i am biased coz of my exposure to standard literature…..
New and fresh readers may find it cozy………. This is not a story but a true………. about those who never want to hurt their family n not want to forget their love…… n how they make possible which cannot happen….. by this story we can learn that if love someone or ur dream that then never quite n try ur best, never lose hope, believe in urself n ur love or dream n in last believe in GOD…… then definately u will get ur destiny……….. The wit of the author is impeccable…and the feelings potrayed in first half makes u revisit the memories u had wen u first fell for some one…hope his message of one country n not two states works for all..eventually i ll luv to give this book to my parents to read…..awesumm story!! cheers! Just came across a great offer for all fans of Chetan Bhagat and thought of sharing with you. This book is available at hindglobal.in for Re 1 only.. But its worth much more.. Worth reading..
One week ago I was just surfing on internet and I came to know that new book of “Chetan Bhagat” has been published: Two States..
Book is worth reading..it rocks guys..must read. This book rocks man….I think it is even better than the first one. I think only Chetan Bhagat can only do it…..Bring out every minute details of the two communities. How are they different from each other..And yet give a humorous touch to the entire story….Read it guys !!! If you are really in love, then read it…..I bet you will enjoy….I have enjoyed it for sure…..
Keep it up Chetan…We need more from you……. And I agree with your recommendation by category of readers. gr8 book…….chetan bhagat rocks man!!!!! His books are really good. I gonna do research work on ur books. I need all ur response n comment about his style and message. No his name should nt be added to literature…….I think his book are just for time pass rather that for learning new and some valuable things……. Novel? I think Chetan lost his originality. It really looks like he have taken some points from various movies and compiled together with his Familiarity and expertise as new book. It looks like watching old movies where lovers try to woe their in-laws( Lot of movie came like that in tamil ). This book can be never compared to his first original one – Five point someone. Am loosing respect to his author. it’s a good 1 for d people who wanna write or wanna become a writer..
a must 4 people who love detailing of scenes in life’s expressions..
a very good presentation of thoughts and incidents in today’s ‘inter-caste marriage’.. guys who r going on d same track, must read it…. i like two states very much.its a lovely love story with nice writing skills. i hvn’t read other novel but i want to do after two states. ITS TOO………………. GOOD…. AND I LOVED THE STORY VERY MUCH…CHETAN ROKCS!!!!!!!!!!!!!!!!!!!!!!!!!!!!!!!! i m just wondering why ppl call the book “2 states” as a movie script.. wat more do u expect from an indian author? .. i think ppl need to encourage his passion for writing ..No one who would quit banking and go for writing.. but he did it.. we must respect him for that …i definitely bet that even a geek could understand his english.. alwayz chetan bhagat rocks !!!! Hello…. to be frank I dont read books , I dint buy any of your books also, On of my coluge got 2 states book to office and asked me to keep it safe as he was going for a break , I was just turning the pages and started reading it , to be frank I was so much involved in that I stoped working and was reading …. I have around 43 pages and I have to leav as I comopleted my shift i asked my friend to give the book for the day but he said NO… I felt as if it happend in front of my eyes …. In my sleep also it was the same ….. I wish I could get guy like you……. your wife is so lucky ….Take care of her , never hurt her…. Trust me from now I will surely buy your books … I will start collecting from the 1st book…. Chetan’s is a very good observer and has a great sense of humour. Add to that, the almost deliberate simplicity of his expression and his sensibly liberal perspective on things, and you have a rare combination – an Indian author writing in English who gets across to everyone with a huge impact. So many of our desi ‘literary’ English authors write so self-consciously they come across as stilted and overly nuanced. As if they are writing solely to win some prize or please the critics. .
Hello.. I don’t know how ..in what words I react on this book.. I just wanna to share that i just gone through some of few pages like 25-27 of them and it is quite interesting …Yesterday I wanna to make it complete as i am very much desperate to know ..What is next ?? but ..today was the office.. .now i m in office but thinking only about last night story.. that is “2 states” is clearly effecting my mind and work.. “its not good yaar..” . Chetan.. you Rock again…. Chetan Bhagat is apparenlty the brand ambassador for TOI’s Aman ki Asha Project. Can you beat that?! Whatever happened to our local netas and other inspiration of the gen-next. Anyway, a politically correct blog. awsum story…….chetan bhagat u rock…..
I’m very much interested in doing research in the writing style of Chetan Bhagat which is so unique and so subtle. Chetan, you are the most happening writer in India today!! hello…………ita a great book by cheta bhagat…i just loved it.the humor.the comparisons……….its great n it rocks.really it rocks….its a must read book 4 every chetan fan……..n i’m his fan…. NICE BOOK, I LIKE IT !!! its 1 of d most fntstic book in d wrld!!!!!!! chetan bhagat rox, wtevr u say!!! the book s very nice. very truly said the book was realy awesome…and aven d review is nicely made…i m sorry if i m using this slangish type of writing on a litrary site…but trully i m amused on reading this book and dis is jst a measure 2 xpress ma feelings…!!! I have heard much about Chetan Bhagat, but I read his book for the first time coz there was no better option in the train which was already late for 6 hours. Thanks to Chetan!! Fortunately the story was somehow related to me too. I love a Tamil Girl . She is Iyer(Tamil Brahmin) and I am north Indian brahmin. We both tried to convince our family but failed. So I found my self much more related to the story. The creation is simple, understandable. It goes with a streamlined motion. It would have been better if there were little ups and downs. would like to read more…. other than this post next time! Thank you. I hope you find other posts interesting too!! Chetan Bhagat ur the best writer……..
Yeah i have read this book recently. Excellent book. Nice humor. Loved Krish Mother’s character very humorous than any bodies in these book. I could not control my laugh in few incidents like first meet of both the parents in IIM Campus and picnic journey. Any way congrats Chetan .Keep up the good work . Waiting for new book from you! It is a story very similar to my life. Only difference is that I am an Tamilian who married a Punjabi girl. While in the very first meeting, I was easily able to impress my North Indian in-laws and their entire family without much effort, my conservative Tam Brahm parents have still not approved of my 8 year old marriage! I am so happy, atleast the story in Chetan’s novel ends on a happy note. This is an explosive edition to a series with a unrival heritage and pedigree. really “SUPERB”…….shows us the actual meaning of “LOVE”……. this is good novel………read it u will know…. wen i first saw the book i thought its not my cup of tea but after reading it i realised i was wrong n nw m a big fan of ur’s(chetan) i wish u publish one book a year..!! i like your book.it give a message to people.i read all yr book. i love this book ……………………………………………………………………………….. This book really rocks…… The best part is when Chetan Bhagat is helped by his dad before his marriage and evn to sort out the fights of two different state family…My opinion about the love marriage as fully changed as love marriage helps to make united .Last line written is the bestest line in the novel.. i just wish there soon gona be a day when in India there will be only one state dats our INDIA…. Resources page is under updates and you will see a more organized blogroll very soon. You can reach me using the contact page. Feedback, tips, suggestions, or just to ask a question. I will try to get back to you as soon as possible. © Few rights reserved. Note: This is my personal site. The views I express here are not related to my current and previous employers. Please read disclaimer for more information.